US-based Jumpking is the world’s largest trampoline maker, with nearly 70 years’ experience. 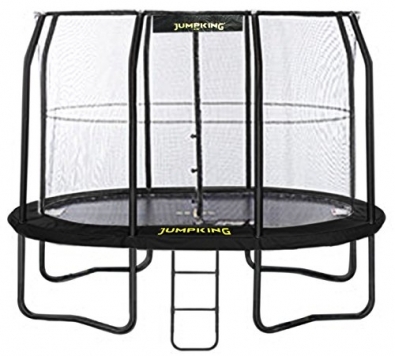 This oval shaped trampoline has 3 different ‘jumping zones’, ensuring you are not drawn into the centre. It is quick, easy and safe to assemble (2 persons required), and comes complete with an integrated UV-resistant safety net. The net is sewn onto the bed of the trampoline ensuring the jumper cannot touch the springs while bouncing on the trampoline, to ensure no fingers or toes can get trapped. With excellent build quality, the manufacturer guarantees the steel frame for 10 years, the bed & springs for 5 years, and then net & pad for 2 years.